I kept reading reviews of Caitlin Morans book How to Be a Woman. 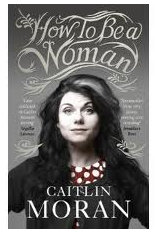 How to be a woman, is an autobiography of Caitlin Moran's life, and it's a book about feminine stuff you encounter as a woman. So when I wandered through the library, and I saw it standing there on a shelf, I jumped on it, and put it in my bag to take home with me! Because even though I ám a woman, you never know what new stuff there is to learn about hów to be a woman. One particular topic that grabbed my attention, was the question about whether it's okay to be hairy down there. And I was shocked to read that modern day man is shocked when he finds himself in bed with a woman who has 'gone bush'. In a way I think that is quite sad. What happened to old fashioned chivalry?! I can't imagine being in bed with my husband, and him critiquing my private parts. He should consider himself lucky he's allowed to get so close! What message do I want to give my kids? Anyway, Caitlin Moran's book got me thinking, about what message I want to give my two daughers and three sons. I don't want my sons growing up thinking women should be bald down there, nor do I want my girls to feel obliged to remove their pubic hair. So I've decided there's only one thing to do: I've got to show them what a real woman looks like. Next time I step out of the shower, I'm going commando! How do you feel about the hair subject of a hairy pubic area? And what message do you wish to impart on your children? lol, this is quite a funny question. Without revealing too much...let's just say I saw a stray hair sticking out one day at the pool...and I rectified the situation immediately. Yuck! Yes, I don't like stray hairs either. Especially not when I'm in public. The thing about saying it's their decision is that they may be getting onesided info. Apparently nowadays in magazines en movies the norm is to be bald down there. So if that's all you see, you're going to think that is how it's supposed to be. That is why I feel it is a topic to have a conversation about. So your kids get áll the information. I hear lots of men do go bald because it makes their crown jewels look larger! My sister-in-law just had the same conversation with me...and she was grouching about male expectation, lol. This is too much isn't it. I'm glad my husband doesn't have issues there. The last thing I want to do is make waxing appointments. I guess you just have to go with your personal wishes. On the other hand, my husband likes my hair on my head long and grey, so I do that for him, because it makes him happy, and I don't care. I guess if it really made him happy for me to be bald down there, I would do it...whatever works!